Very low profile as mush as it is expensive !!!! Very popular... small reception.... no bar .... no chicha..... I didn’t like it at all!!!!!! I like the location, the swimming pool for children and decoration. overall it is recommended for families to spend a weekend their. It’s absolutely the perfect family resort, It include a full day activity for kids, I had an Amazing perfect Thai massage with Lo. Staff are welcoming & friendly, staff working in the breakfast tent will keep running like a bee with a smile, never bothered! The suite is very large & good for families. As I stayed in the same Hotel when it was just opened, I found everything was in order and as new as first time I stayed in. The facility is clean and well maintained. Staff seems working hard to satisfy guests. It was a great stay. Lagoona Beach Luxury Resort and Spa This rating is a reflection of how the property compares to the industry standard when it comes to price, facilities and services available. It's based on a self-evaluation by the property. Use this rating to help choose your stay! One of our top picks in Manama.Lagoona Beach Luxury Resort & Spa is set in Manama, a mere 5 minutes’ drive from the Saudi causeway, just 15 minutes’ drive to the main malls in Bahrain and 25 minutes’ drive from the International airport. Featuring a private beach, this 5-star resort provides free WiFi and spacious rooms with balconies offering a sea view. It offers a spa, gym, outdoors swimming pools for kids and adults, indoor heated swimming pool and Multi sports court such as basketball and tennis. All apartments are decorated with plentiful light and natural materials, warm flooring, artwork featuring Bahraini history on the walls and floor-to-ceiling windows. Each one has a fully equipped kitchen with a dining area and large seating area with a 42” flat-screen IPTV including satellite channels and DVD player. 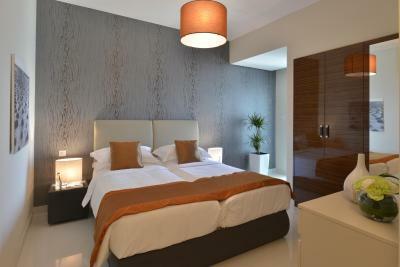 Extras include bath robes, complimentary toiletries, special amenities, 24 hours butler service, safe box and hair dryer. 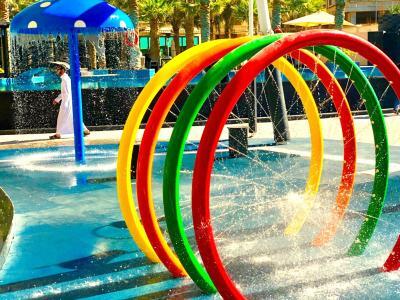 For the little guests, Lagoona Beach Resort even has its very own water park where kids can enjoy a variety of activities such as kids swimming pool with water slides, mushroom umbrella, fun arc rainbow and large water gun. Plenty of activities for the kids and adults are available at the resort itself such as free pony rides, cartoon characters, Indian drummers, jumping castle, flame throwers and fireworks. Kids can also enjoy at Magic Land, the resort’s indoor play area equipped with arcades, PlayStation, Air hockey tables and a thrill-filled 9D Kids Cinema. At Haven Wellness, Salon & Spa, guests have a full wellness experience in Haven spa, which features sauna, steam rooms and a hairdressing salon for women. There is a huge variety of services such as massage therapies, facial treatments, body treatments, rituals and hammam therapies. Guest can stretch muscles using the fitness center’s cardio-vascular stations and resistance machines. Guests can also avail personal training sessions by a Certified Personal Trainer. Lagoona Beach houses an exclusive ladies-only swimming pool overlooking the sea, with a huge water fall. Another new addition is the resort’s private island beach, with its pristine sand with the cool waves coming up over your toes and ankles, while you sunbathe on turquoise sunbeds. And while you do that, enjoy some refreshing mocktails, mojitos, churros and slush or a quick meal, from the Sunset Lounge, Lagoona’s very own beach side café, ideally located on the water’s edge. The Mirage Lounge, at Lagoona Beach Resort & Spa, redefines the executive lounge concept with the ultimate in exclusivity and attentive services. A warm and comforting atmosphere paired with beautiful interiors awaits you. 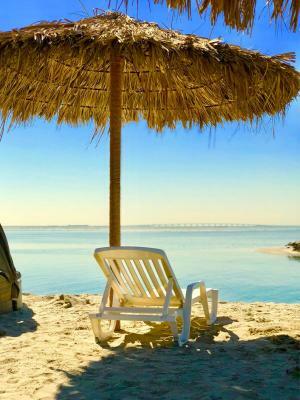 At this resort, guests can enjoy a variety of activities in the surroundings, including Bahrain’s most extensive selection of watersports such as jet skis, boat trips, doughnut rides, banana boat, water sofa rides and many more. Also, new to Lagoona, an over the water Zip line – The first of its kind in the region. Car hire is also available. When would you like to stay at Lagoona Beach Luxury Resort and Spa? This apartment has a balcony, soundproofing and seating area. Located on the top floor, the Royal Penthouse effortlessly combines Bahraini heritage with contemporary design. Enjoy unrivaled panoramic views of Arabian Gulf from your private infinity pool and gazebo. It is extra spacious with over 450 square yards of private space. This Penthouse features four bedrooms, all en-suite. The master bedroom has a spa bath as well as stand-alone rain-shower and bidet. Enjoy the latest technology and state of the art appliance fitted throughout the penthouse. The Royal Penthouse gives guests the unique experience of living in an architectural masterpiece. This apartment features a satellite TV, oven and microwave. 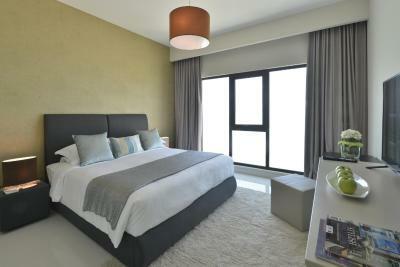 The beautifully designed penthouse with bespoke furnishings offers 320 square yards of luxury. It has three bedrooms, including a master bedroom with an indulgent spa bath. The penthouses also include a private infinity pool and pool deck, with a truly breathtaking view of the sparkling sea below. Enjoy the latest technology and state of the art appliance fitted throughout the penthouse. House Rules Lagoona Beach Luxury Resort and Spa takes special requests – add in the next step! Lagoona Beach Luxury Resort and Spa accepts these cards and reserves the right to temporarily hold an amount prior to arrival. Please note that the city tax 10% will be calculated on the total amount including the 10% service charge, which amounts to 21% of the total price. Please Note that Buffet Breakfast is served on Fridays & Saturdays, in-room continental breakfast is served on other weekdays. When booking on half-board rates, the dinner included is a set menu. Please note that the hotel is undergoing minor maintenance and facility enhancements. During this period, guests may experience some noise or light disturbances, and some hotel facilities and services may not be available. Staff, bed not comfortable and only 4 elevators serving around 28 floors. Not enough elevator. It’s so crowded need to wait longer Other than that’s is okay. I like every thing unless the cleanese of the beach. rooms need cutlery and dishes, dish detergent, scrubbies, drying rack for clothes. Excellent service all around. Thx you Badshah from housekeeping, Serena and the other wonderful staff from dining. So many things geared towards kids, pools, waterpark, pony, playground, trampoline, etc... hardly have to get off the hotel grounds. suites are large and well kept. elevators are fast. wifi was not that good for working. Normal wifi usage for leisure was ok.